Introduction: Although the exact the prevalence of flatfoot in children is not known well, it seems that flatfoot is the most common orthopedic issue seen in pediatrics. Method: 400 high school students were randomly selected from Marvdasht’s high schools. Individuals who do not have foot arch while standing are considered as flatfeet and those for whom jack test becomes negative, who have the lack of flatness of feet arch while raising hallux, are considered as hard feet. Results: 377 individuals had normal feet, 13 individuals had flexible flat feet and 10 individuals had hard flat feet. The prevalence of flexible and hard feet was 4 and 2 in males and 6 and 11 in females in high school age respectively. The number of normal weight in flexible feet group is higher compared to rigid feet group and no significant difference is seen in terms of BMI and family history in the two groups of flat feet. Discussion and conclusion: the prevalence of flat feet is relatively lower in individuals ages 14-18 years old and this is probably because the age of the individuals is higher which indicates the theory that cases of flat feet are resolved when age is increased and the individual reaches puberty. Flexible flat feet, Flat feet, Marvdasht students. Although its exact prevalence of flat feet in children is not known well, flat feet seems to be the most common orthopedic issue seen in pediatrics. All children are born with flat feet and more than 30% of them have the deformity Calcaneovalgus feet. This condition is not often painful and is usually resolved without any therapy though in some rare cases there is a need for corrective plaster for improvement. The prevalence of flat feet is reduced in the ages of three to six and because of walking and activity of the child, the fat mass in central arc disappears. Also the prevalence of flat feet is higher in boys than girls . In fact it should be noted that there is not enough information on this but the researches have shown that in contrast to common opinion, flat feet is not considered a dangerous and complicated condition. For example, in Canada, a study on the 3600 soldiers was done and showed that flat feet didn’t cause any major problem in them. There is another common opinion among people that flat feet results in the deviation of toe (Hallux valgus). A study has been done in England that rejected this hypothesis. Some of the complications that are caused by flat feet are related to arch foot functions. It is suggested that the function of these arcs is to make more mobility and absorb and disperse the shocks that come from metatarsus to body. It is obvious that without these arcs, the forces that are created by walking, running and jumping enter to the metatarsus and then these forces are transmitted to upper parts of the body and result in many problems in different joints such as knee and spines. In fact it can be said that a major part of the mechanism of the absorption of the shocks that are created by the body weight faces problem due to this condition. This deformity, in addition to weakening the usual ability of the foot, changes the feet structure in a way that the patient tends to put his/her toes towards outside and talus and heels get out of their normal condition during walking. Due to this deformity, the toes lose their function and consequently the muscles that are involved in bending and moving the toes become weakened. If this acquired condition especially in children is not treated, bone changes will occur and this condition will be constant in adulthood [1-3]. In many cases of flatfeet in children the parents are worried, flatfeet in the child has no symptom and there is no need for any therapy. In such cases the best therapeutic action is persuading the parents that the child needs no therapy for his/her flatfeet. Foot arc reduces the forces coming into body from the earth does not let all the forces to enter the body but in individuals with flat feet all the forces reach the body due to the lack of arc in the feet and result in some connected problems in all the joints in body and especially the spines. Flatfeet are usually congenital. The looseness of the joints in the metatarsus make the arc of metatarsus disappear when the individual is standing. Also, the lack of complete formation of one or two bones in the ankle and metatarsus or their congenital attachment impacts the lack of formation of foot arc . There are different diseases that can result in flatfoot and sometimes flatfoot is the initial symptom for beginning of these diseases and due to the prevalence of this condition in society and its consequences, if the condition is diagnosed on time through screening, the complications resulted from this condition and underlying diseases can be improved [4-7]. The purpose of this study is to explore the prevalence of flatfoot and the types of this condition in high-school-aged (ages 14-18) children. This study is descriptive of cross-sectional type. The population of this study is consisted of high school girls and boys in Marvdasht city. 21 schools have been selected by cluster random sampling among high schools in Marvdasht. Then, through coordination with Education Department and the schools, 400 written permission forms together with a form asking for children’s particulars were distributed and collected one week before the beginning of the study. The individuals who had recognized endocrine problems, problems in spine, diabetes, severe trauma or individuals who had surgery for any reason before were excluded from the study. In this study, there was no student with a problem that result in the reduction of the sample. Choosing the samples was done by counting students or through the list of students in class, and sampling was finished in every school after finding the required numbers of students. Students whose arc of foot disappear while they are standing and the inner side of their feet is flat are considered as flatfoot while the students who have negative jerk (the lack of flatness of feet arch while raising hallux) are considered as students with rigid foot. Initial estimates of the prevalence of flatfoot in the previous studies were 23% to 28%. Status of students with flatfoot was investigated by 2 evaluation form that are given in the appendices 1 and 2 and the following factors were investigated for all the students. FHX: family history of the student. Looking for abnormality callosity: the skin thickness in the region of bone prominence which is usually more common in rigid foot. Looking for ligament laxity: instability of ligament was investigated. Checking the shoe for wear pattern: the shoes of individuals who have flat feet wear quicker. Footprint-hind foot movement: foot this case is rare in the rigid and usually we examine three joints by this test: subtalar, talonavicular, calcaneal-cuboid. Jack test: in this method, the great toe is raised with hand, if no arc appears in the foot, the person has flatfoot. Neurological assessment: explores whether the person has the neurologic disorders that may result in the instability in the joints and abnormality in the metatarsus or not. 2. Whether arc is formed in the feet of individuals with flatfeet. For measuring flatfoot disorder, the researcher put his index finger on the convex of bone and put his thumb in the front part of the foot under the Medial malleolus and patient rotated his/her foot smoothly towards inside and outside till the index finger and thumb were in one line (Figures 1-3). The criterion for measurement in this study which has been the proportion of flatfoot to body mass index in the boys and girls, has been based on the diagrams in Figures 1-4. Figure 1: The method for diagnosing flatfoot. Figure 2: Determining body mass based on age in girls. 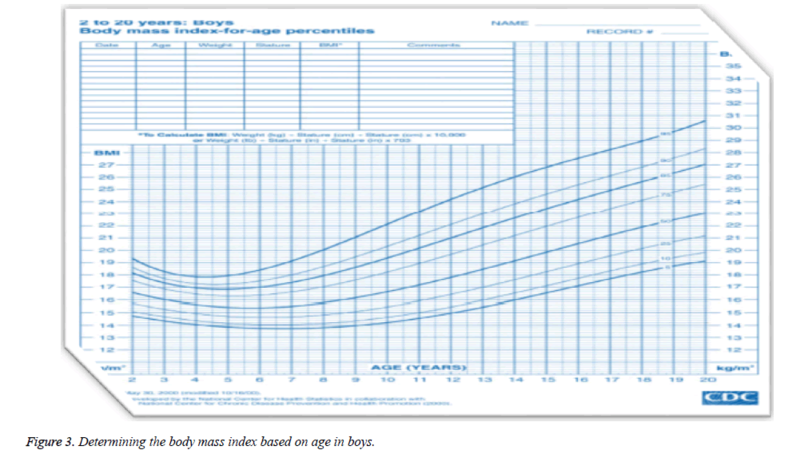 Figure 3: Determining the body mass index based on age in boys. Figure 4: Body mass index classification in children and young adults. Determining the prevalence of flatfoot in students and chi square, which is high when the model has a weak compatibility and is high when the model has a high compatibility, were obtained in the software SPSS 19 and the data were transferred to excel for drawing the charts. The individuals who participated in this study were 156 boys and 244 girls. About 377 individuals had rigid foot and 13 students had flexible flatfoot and 10 students had rigid flatfoot. The percentage of students who have normal feet was more than other groups. 17 students had a weight of 40 to 50 kg, 94 students had a weight of 51 to 60 kg, 142 students had a weight of 61 to 70 kg, 71 students had a weight of 71 to 80 kg, 49 students had a weight of 81 to 90 kg, 15 students had a weight of 91 to 100 kg, 10 students had weight of 101 to 110 kg and 2 students had a weight of 111 to 120 kg. The frequency of every weight level has been provided below. It can be concluded that the frequency of students who have a weight between 61 and 70 kg is more than that others. 1 student had a height of 1/20 to 1/30 m , one student had a height of 1/31 to 1/40 m, 34 students had a height of 1/41 to 1/50 m , 54 students had a height of 1/51 to 1/60 m , 102 students had a height of 1/61 to 1/70 m , 131 students had a height of 1/71 to 1/80 m ,64 students had a height of 1/81 to 1/90 m and 13 students had a height of 1/91 to 2/00 m and the percentage of students who had a height between 1/71 and 1/80 m was more others. Regarding the family history, it was seen that 95 cases had chosen the yes as answer and 305 cases had chosen no as answer. 1 case was underweight, 271 students had normal weight and 81 students were at the risk of overweight and 47 students were overweight. Regarding the variable abnormal callosity, it was seen that 40 students had chosen yes as answer and 360 students had chosen no as answer. Regarding leg laxity, it was seen that 58 cases had chosen yes and 342 cases had chosen no as answer. Regarding shoe wear, it was seen that 128 cases had chosen yes and 272 cases had chosen no as answer. Regarding the variable hind foot movement, 36 cases had chosen yes and 364 cases had chosen no as answer. Regarding jack test, 24 cases had chosen yes and 376 had chosen no as answer. Regarding neurological assessment it was seen that in 400 filled out forms 38 cases had chosen yes and 362 cases had chosen no as answer. Regarding standing on tip toe, 59 individuals had chosen yes and 341individuals had chosen no as answer. Considering the weakness of feet at night, 168 cases had flatfoot and 232 cases had normal feet. Considering pain in feet at night, 119 cases had flatfeet and 281 cases had normal feet. Considering pain in leg, 93 cases have flatfeet and 307 cases had normal feet. Considering early fatigue after walking, playing and sport activities, 74 cases had flatfeet and 326 cases had normal feet. Considering fatigue variable, lack of interest in sport activities and walking, 127 cases had flatfeet and 273 cases had normal feet. The prevalence of flexible flatfeet by gender in children ages 14-18 years was 2 in males and 11 in females. The prevalence of flexible and rigid flatfeet by gender in children ages 14-18 years was 4 in males and 6 in females. The prevalence of flexible and rigid flatfeet by gender in children ages 14-18 years was 6 in males and 17 in females. Table 1 is shown the comparison of qualitative variables in two groups using the chi-square test. As shown in the table, the number of normal weight in the flexible flatfeet group is more than that of the rigid flatfeet and the number of at risk of overweight in the flexible flatfeet group is more than that of the rigid flatfeet group and no significant difference in BMI is seen in the two groups with flatfeet (P=0.768). Table 1: Comparison of frequency distribution of BMI levels in the two flatfeet groups. As a result, there is no relationship between incidence of flatfeet and BMI in high school children (ages 14-18). Table 2 gives a comparison of the qualitative variables in the two flatfeet groups using chi-square test. As shown in the table, the number of NO in family history is more in the flexible flatfeet group than in the rigid flatfeet group and number of YES in family history in both groups are equal and no significant difference is seen in the two flatfeet groups in terms of family history. (p=0/772) as a result, there is no connection between incidence of flatfeet and family history in children ages 14-18 years. Table 2: Comparison of frequency distribution of family history levels in the two flatfeet groups. Table 3: Comparison of frequency distribution of fatigue symptom and foot weakness at night levels in two flatfeet groups. Table 4: Comparison of frequency distribution of pain in foot symptom levels at night in two flatfeet groups. Table 5: Comparison of frequency distribution of leg symptom levels at night in the two flatfeet groups. Table 6 compares the qualitative variables in the two flatfeet groups using chi-square test. As shown in the table, in the flatfeet group, the number of pain induced by sport or walking symptom is equal in the flexible and rigid flatfeet groups and in the normal feet group, the number of pain induced by sport and walking is higher in the flexible group than in the rigid flatfeet group and no significant difference is seen in the two flatfeet groups in terms of the pain induced by sport and walking . (p-0/580) as a result there is no connection between incidence of flatfeet and pain induced by sport and walking symptom in children ages to 14-18 years. Table 7 compares the qualitative variables in the two flatfeet groups=using chisquare test. As shown in the table, in the flatfeet group, the number of early fatigue symptom in walking, playing and sport activity is higher in the flexible flatfeet group than in the rigid flatfeet group and in the normal feet group, the number of early fatigue symptom in walking, playing and sport activity is equal in the rigid group and the flexible group and there is no significant difference in early fatigue in walking, playing and sport activities in the two groups. (p-0/708) as a result, there is no connection between flatfeet and early fatigue in walking, playing and sport activities in children ages 14-18 years. As shown in table 8, Spearman’s correlation coefficient between two studied variables is -0/110 and the significance level of Pearson’s correlation test is 0/617 which is more than 0/05. Therefore, based on Pearson’s test, the null hypothesis is not rejected which means that there is no significant relationship between incidence of flatfeet and all symptom dimensions. Table 6: Comparison of frequency distribution of pain in foot induced by sport and walking in the two flatfoot groups. Table 7: Comparing frequency of early fatigue symptom levels in walking, playing, and sports activity in two flatfeet groups. Table 8: Spireman correlative test table between indication of flatfoot and whole dimension symptom. Although the exact prevalence of flatfeet in children is not known well, it seems this condition is the most prevalent orthopedic problem seen in pediatrics. All the children are born with flatfeet and more than 30% of them have calcaneologus deformity when they are born. Harandy et al. in investigating the flatfeet and its epidemiologic in Iran, found that out of 880 studied foot in children (7-14 years), 6/9% had mild and severe flatfeet. 53/8% of the patients with flatfeet had symptoms and, considering the prevalence of symptoms in 40/1% of normal people, there is few cases with flatfeet in which the symptoms are due to flatfeet. The prevalence rate of symptoms is proportional to the severity in the flatness of foot which means that 88/9% of children in severe cases, 69/6% in medium cases 40/7% of these children in mild cases had symptoms. The rate of shoe wear and tear was higher in patients with flatfeet than in normal people in the study. The symptoms that had been investigated by Harandy included fatigue and weakness in feet at night, pain in feet at night, pain in leg at night , pain induced by sport and walking, early fatigue in walking, playing and sport activities and lack of interest in sport and sport activities. The prevalence of flatfeet was estimated to be 35/2%. They estimated the medium cases to be 5/2% and severe cases to be 1/7% and they obtained the prevalence of 6/9%. The prevalence in both feet was three times more than in the one foot. The rate of flatfeet prevalence was not much different in overweight group and normal weight group, though the differences between these two groups and the underweight group were more significant. However, the prevalence of symptoms was much higher in the overweight group, compared with the two other groups. The symptoms in patients with flatfeet abnormality was 53/8% and these symptoms are low. These symptoms existed in 40.1% of the individuals with normal feet . In the present study too, no significant relationship was seen between prevalence of flatfeet and BMI. Different statistical data have been reported regarding the prevalence of flatfeet. In studies conducted on children ages 2-10 years with foot print, it was shown that 97% of the children had flatfeet until the age of 2, while only 4% of 10 year old children had flatfeet. Studies of flexible flatfeet have reported a prevalence of 1/9%. In none of the studies above the side(s) of flatfoot has been mentioned. The prevalence of one-sided flatfeet in children (4-5 years) is 0/6% and prevalence of two-sided is 2/22%. In children ages 4-6 years, 2/8% of the bare feet and 8/6% of those wearing shoes had flatfeet. The prevalence of flatfeet in girls is a little higher than boy. One study in Turkey reported that the prevalence of flatfeet in girls was 2 to 2.5 times higher than in the boys . That study is consistent with the present study as the prevalence of flatfeet in girls was obtained to be more than boys in the present study. A study was conducted on the prevalence of flatfeet in high school boys in Turkey in 2006. The results indicated that 22 individuals had flatfeet among 3169 individuals that had been randomly chosen as sample. The prevalence of flatfeet were determine for genders. Rigid and flexible flatfeet can result in severe disabilities. 3141 of the participants had normal feet. The prevalence of flatfeet in their studies was 0/69%. The difference between the two studied groups was not significant. Weight did not have any impact on the prevalence of flatfoot. The mean height was 165.5 ± 7.3 in the normal group and 166.4 ± 7.8 in the flatfeet group. The height did not have any impact on the prevalence of flatfeet . That is consistent with the results of the present study. Also, weight did not have a significant relationship with prevalence of flatfeet. Flatfeet in children and adults are induced by different factors such as genetics. A study was conducted on flatfeet in high school students in Serbia. The samples were from 28 high schools for males and females. The samples had a height of 173.6 ± 9.10 cm and their weight was 63.99 ± 11.18 and their age was 16.64 ± 0.88. Flatfeet was investigated in 228 cases and 111cases (48/7%) had flatfeet and 117 cases (51/3%) had normal feet. The results showed that that there was no significant difference in percentage of individuals with flatfeet and normal feet. Determining the prevalence of flatfeet in the children ages 3-6years and factors such as age, weight, and gender were explored in the study. 835 children (411 girls and 424 boys) participated in this study. Clinical diagnosis of flatfeet on the feet was based on the position of heel and weak formation of leg. The feet of children was measured by their standing position using level and the rear left angle of foot was measured. The rear left side angle is the angle over Achilles tendon and the spread in all rear left side angle was measured . The prevalence of flexible flatfeet in group individual’s ages 3-6 years was 44% and pathological prevalence of flatfeet was 1%. 10% of children had covered their leg. The prevalence of flatfeet had significant reduction accordance to the age and in group of individuals ages 3, 54% had flatfeet, while in group of individuals’ ages 6 years, 24% had flatfeet. The average of rear left side of feet was 5.5 degree. Flatfeet were high in boys than girls; the prevalence of flatfeet was 52% in boys and 36% in girls. 13% of children were overweight and obese. There was a significant difference in prevalence of flatfeet overweight, obese and normal-weight children . However, in the present study the prevalence of flatfeet was higher girls than in boys and it had no relationship with weight. In children who have flatfeet since they are born and this problem is solved during childhood, there are different dangerous factors for spread of the flatfeet which include age, high weight and obesity. A study was conducted with the purpose of determining the prevalence of flatfeet in two different populations with different societies, cultures and geographic specifications in Colombia. That study investigated elementary school children of 3-10 years old. The schools were in the Bogota and Barranquilla. Out of 940 children , 60% were in Bogota and flatfeet was determined by the physical test and the universal prevalence of flatfeet was 15/74% and the distribution and spreading of it was 20/8% in Bogota and 7/9% in Barranquilla. In children ages 3-5years, the prevalence was 30/9% and then after this age there was a meaningful reduction in the prevalence. In children ages 3-5 years from Bogota, the prevalence was 38/3%, while the prevalence in children from Barranquilla was only 17/3%. There was a significant reduction of prevalence in the children aged over 6 years and the connection between flatfeet and age, town, gender, and body mas was pointed out. The prevalence is more in Bogota than in Barranquilla . In a study that was conducted by Mihanpour Taheri during 1993-1994 and explored the prevalence of flatfeet in 5 schools, the results indicated that the prevalence of flatfeet in children was considerable and most of them were of a flexible type. Therefore, the treatments are more effective if they are started early. The results of their study indicated that 215 of the total 233 individuals i.e. 92/7% had flexible flatfeet and their pain was less than those with rigid flatfeet. In their study, overall 215 persons had flexible and 17 persons had a rigid feet , which is consistent with the results of this study to some extent. The study by Charrette that investigated the development of the arcs of metatarsus in children showed that after 10 years, the reduction of metatarsus in the child could be seen, and especially if the child has the overweight, performing physical movement programs and prescribing the suitable orthosis is necessary for the treatment [15,16]. The report of Janghorbani and Parvin  about the girls ages14-21 years in Kerman indicated that the prevalence of overweight and obesity in the subjects was than in their peers in Canada, Australia, Europe and even some Asian countries. A relationship between the disorders in the lower part of body and overweight and obesity in children and young adults is seen but this relation was not significant in the present study. The results from our study and comparison with other studies conducted in and other parts of the world indicated that the prevalence of flatfoot students ages 14 to 18 years in Marvdasht lower, compared with students in other studies and that gender had no effect on the prevalence of flatfeet. Probably the lower rate of prevalence in the study is due to the higher ages of individuals and this can indicate that with the increase of age, the prevalence of flatfeet is reduced and this suggests the hypothesis that most of flatfeet cases in childhood are treated without any therapy as the individual grows up. Also, physicians can monitor children with flatfeet as they grow up and examine them after puberty to ensure the resolving of the flatfeet. The present article was extracted from the thesis written by Sina Farzan and was financially supported by international branch of Shiraz University of Medical Sciences (grants number: 85/1025). Kapandji IA. The physiology of the joints: lower limb. 2nd Ed Edinburgh Churchill Livingstone, London 1987. Levangie PK, Norkin CC. Joint structure and function: a comprehensive analysis: FA Davis 2011. Kayano J. Dynamic function of medial foot arch. Nihon Seikeigeka Gakkai Zasshi 1986; 60: 1147-1156. Bresnahan P. Flatfoot deformity pathogenesis. A trilogy. Clin Podiatr Med Surg 2000; 17: 505-512. Aydog S, Tetik O, Demirel H, Doral M. Differences in sole arch indices in various sports. Brit J Sports Med 2005; 39; e5. Sullivan D, Warren RF, Pavlov H, Kelman G. Stress fractures in 51 runners. Clin Orthopaedic Res 1984; 187: 188-192. Alamy B. An epidemiologic study of flat foot in Iran. Tehran Univ Med J 1997; 55: 78-83. Evans AM, Nicholson H, Zakarias N. The paediatric flat foot proforma (p-FFP): improved and abridged following a reproducibility study. J Foot Ankle Res 2009; 2: 1-8. Çilli F, Pehlivan Ö, Keklikçi K, Mahirogullari M, Kuskucu M. Prevalence of flatfoot in Turkish male adolescents. Eklem Hastalik Cerrahisi 2009; 20: 90-92. Milenković S, Živković M, Bubanj S, Živković D, Stanković R, Bubanj R. Incidence of flat foot in high school students. Facta Univ Physical Edu Sport 2011; 9: 275-281. Pfeiffer M, Kotz R, Ledl T, Hauser G, Sluga M. Prevalence of flat foot in preschool-aged children. Pediatrics 2006; 118: 634-639. Enrrique VA, Sánchez RFS, Posada JRC, Molano AC, Guevara OA. Prevalence of flatfoot in school between 3 and 10 years. Study of two di. Revista Colombia Médica 43: 142-147. Pourtaheri Mahin IGR. Thesis Prevalence of flatfoot in the fifth grade students (male and female) education in Shiraz in the academic year 73-1372. 1373. Masterson JT, Findlay JC, Kaplan F, Bridgham T, Christian D, Galbraith A. Art therapy and clinical neuroscience: Jessica Kingsley Publishers; 2008. Charrette M. Children, flat foot and esthetic support. J Chiropractic 2003; 23: 102-110. Claus AP, Hides JA, Moseley GL, Hodges PW. Is ‘ideal’sitting posture real? : Measurement of spinal curves in four sitting postures. Manual Therapy 2009; 14: 404-408. Janghorbani M, Parvin F. Prevalence of overweight and thinness in high-school girls in Kerman, Iran. Int J Obesity 1998; 22: 629-633.